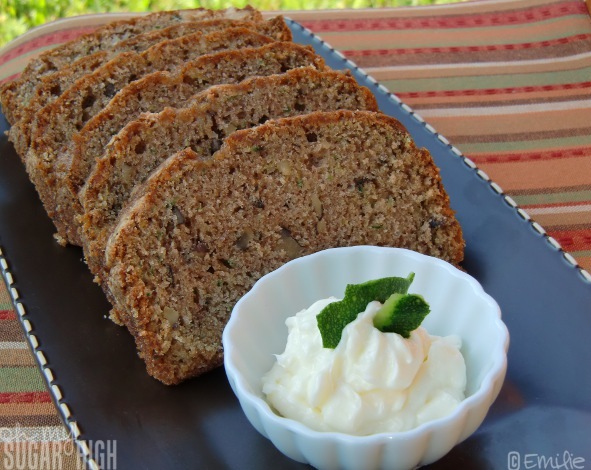 With all the Zucchini ripening in your gardens, I thought this would be a perfect time to share a recipe for zucchini bread. I love the moist texture and subtle flavors in this bread and I’m certain you will too! This recipe is for two full loaves but I was able to make 3 mini loaves and one regular sized loaf. The mini loaves make great gifts and are so easy to freeze for later! Grease and flour two 8 x 4 inch pans or 5 mini loaf pans. Preheat oven to 350 degrees F. Mix flour, salt, baking powder, soda, cinnamon and nutmeg in medium bowl. Bake for 40 to 60 minutes or until tester inserted in the center comes out clean. Cool in pan on wire rack for 20 minutes. Remove bread from pan. Cool completely. With recipes that contain significant amounts of oil, I always like to cut that amount in half and replace it with unsweetened applesauce to make it a bit healthier. However, if you don’t have any applesauce, you can easily use a cup of oil. I absolutly love you guys! My fiances dad gave us som Zucchinis & I asked him last night if he knew how to make Zucchini bread & he said no. So I was going to have to look it up today, you guys are mind readers! I totally saw that coming. That is why I made sure this post went up this morning. I’ve SO got your back Kimberly. Thanks – I’m going to bake it! Okay, as you know I’m not a huge fan of Zucchini, I use to call them icky yellow pickles when my mom forced them on me at dinner time, but I’ve never tried them baked into bread and this actually looks surprisingly delicious! Really it is so similar to carrot cake. You would never know it is a vegetable in the bread. Instead it just makes it really moist and flavorful! He would probably like it. I know my mom hates bananas (crazy right?) but she loves banana bread. This is much like that. Really if he didn’t know it was zucchini in there he wouldn’t know. You can’t really tell it by the taste, just the green flecks. Most recipes call for grated zucchini but I shredded mine so it really isn’t overwhelming at all. I really like zucchini so this sound so delicious. And unique! Ooooh, your recipes look so yummy. Love your blot – very easy to read and “friendly” to the eye. Thought I also had a recipe from a blog for blueberry zucchini cake or bread. Rats! Can’t find that one. I made the zucchini bread last night. It came out awesome!! I got 3 small loaves from the one recipe and gave two away, wishing I hadn’t! definitely going to make more. Looks amazing and I can’t wait to make it =) But I was wondering what the white stuff is you show served with the bread in the pic? This is amazing! I made four large loafs and 10 mini loaves – Thanks for sharing. This bread has such great flavor! I think next time I’ll try it with apple sauce as it’s just a tad bit on the dry side. Thanks for sharing, I LOVE it! Made two loaves. Found this recipe on pinterest. I substituted golden raisins for the walnuts (allergy) and baking right now. Smells amazing! I am so happy to hear that you liked this bread so much! I love it too. 🙂 Thanks for taking the time to comment, and I hope to see you around again soon! !